A disagreement between two government agencies has stalemated a solution to a big problem for the Iron Range town of Bovey. That's where a nearby mine pit continues filling with water that could inundate Bovey if not stopped. The 2008 state bonding bill authorized $3.5 million to draw down water in the Canisteo Mine pit -- and two years later the money remains unspent while the water keeps rising. Drive through Bovey and you go downhill to the business district, until you encounter a high dirt wall. On the other side is water that reaches about 20 feet above the ground surface in town. The water has been rising since 1985, when the last mining company pulled out of the deep hole today known as the Canisteo pit. The lake that formed there is about 300 feet deep and five miles long. There's general consensus the water level threatens Bovey and needs to be drawn down -- and little consensus how. State Rep. Tom Anzelc, DFL-Balsam Lake, has tried to address the problem since he took office in 2007. Two years ago Anzelc pushed legislation providing $3.5 million to the Western Mesabi Mine Planning Board to address the problem. But the state Department of Natural Resources has to sign off on any solution, and the two bodies support two completely different plans. "This is government incompetence," Anzelc said. "This is an example of why people are losing confidence in government's ability to solve basic problems. Mine planning board Chairman Dave Lotti watched the water rise another foot just this past winter. "The sad thing of it is ... while this goes on the pit water keeps rising," Lotti said. "The current level of pit water is 1315 [feet above sea level]." The numbers matter. Studies show that if the water was just 15 feet lower it would stop flowing into nearby basements. The pit is running out of room for water, with only about 10 more feet of space before it comes over the top of the pit wall, according to DNR Regional Director Craig Engwall. "At some point, years down the road, it could overtop at a certain stage," Engwall said. "And we are not going to let it get there." The longer the money sits unspent, the greater the sense of urgency at the DNR, where officials have turned up the heat on the mine planning board. The board wants to drain water to the east, to Trout Lake. 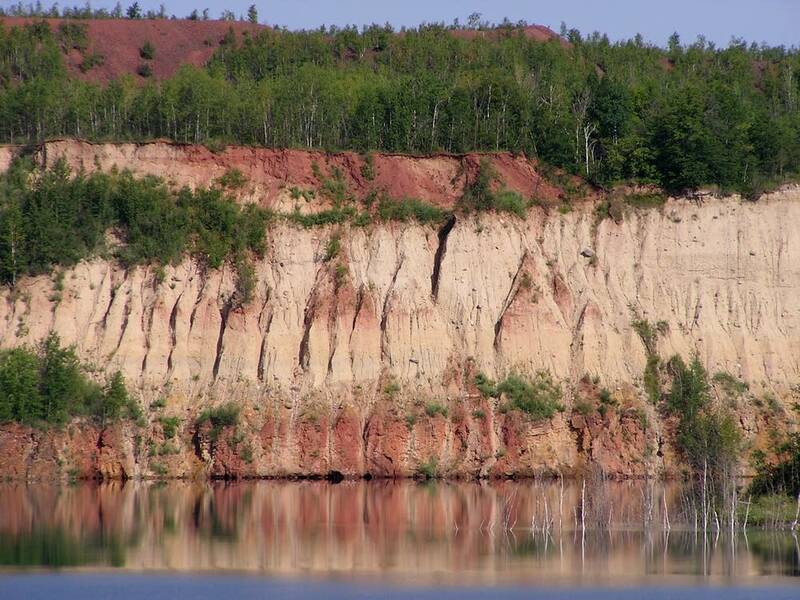 DNR officials think the mine board's plan is too expensive and too slow. It's also filled with complications that include a little fish, Engwall said. "There are smelt, rainbow smelt in the Canisteo pit, and they are an invasive species, and it's illegal to transport an invasive species to other bodies of water," he said. The planning board has ideas to keep smelt from reaching Trout Lake, but things like filters do drive up the cost. Meanwhile, the DNR has threatened to impose its own plan. The DNR prefers a route in the opposite direction, to the west. The water would flow to shallow rivers where smelt could not survive, Engwall said. But the DNR plan also creates a new waterway through iron ore reserves -- land some people expect to mine, and may be reluctant to give it up for a drain. I wish them luck on that plan," Lotti said. "I really, really, do feel that they are going to have trouble with landowners over on that end." The DNR is about to start drain tile work this summer. That should help stop the immediate seepage in Bovey. Meanwhile, Engwall said he'll be back before the mine planning board next week, hoping to settle on a final solution to the pit water. "We have to have a plan very shortly thereafter," he said. The funding can't sit forever, Engwall said. The DNR commissioner has to spend it on flood mitigation somewhere, if not Bovey. "If we still have a total lack of agreement on a project from the board itself, the commissioner can choose to implement a project," Engwall said. He meets Tuesday with the mine board in Bovey.